In the morning of June 19, bleary eyed negotiators left Pavilion 3 of Riocentro to return to their hotel rooms to freshen themselves up. A long round of intense negotiations had taken place the previous night to finalise the outcome draft of the United Nations Conference on Sustainable Development, also called Rio+20. Riocentro was the hall where the conference took place, some 30 km from Rio de Janeiro, Brazil’s second largest city. Negotiators had found the night of June 18 tough. Sustenance had been difficult with the food court shut and coffee and munchies unavailable. Hungry negotiators waddled through the corridors looking for food. As the intensity of parlays increased inside Pavilion 3, tempers too went up. At one point, harried negotiators from Venezuela asked the civil society representatives, allowed to be part of the negotiations for the first time, to leave the room. Yet, it had been a decisive night. Negotiators from 191 countries had managed to achieve what they could not in the past six months during informal negotiations. There had been agreement on less than 25 per cent of the draft compiled by the United Nations. On June 15, the last informal negotiation, when the co- chairs reported that very little progress had been made, the Brazilian presidency decided to take over from the UN Department of Economic and Social Affairs. In less than a day, it introduced its own text and created subgroups with Brazilian diplomats heading them all. In many ways, a new negotiation process was set into motion. The new draft favoured developing countries. At a press conference on June 18, the Brazilian delegation announced that except for a few paragraphs the draft was agreed upon by all the countries. However, two of the most important aspects, sustainable development goals and green economy, were yet to be decided. Indian negotiators told reporters that they had managed to persuade developed countries to keep the phrase “common but differentiated responsibility” in the draft. By the evening, negotiators from developing countries informed reporters that the European Union may give in to the pressure and a compromise formula of letting the United Nations General Assembly decide on sustainable development goals was being mooted. By midnight all issues barring those of the high seas and self-determination of people under foreign occupation had been decided. It was about 4 in the morning when the text was finally agreed upon. The next day, the agreed draft was printed by the Brazilian presidency and circulated among the negotiators. But it could not be called a conference document as it had not yet been formally adopted by a plenary. Unlike previous UN conferences, where all the negotiation drafts were released to the public despite being under deliberation, this text was marked by utter secrecy. The Brazilian government had worked hard on the draft. It did not want to solicit premature comments from non- government organisations and activists. Countries agreed upon a document that could be called the conference’s outcome. About 100-odd heads of states and top government representatives were to arrive the next day. Australia, India, China, France, Russia and South Africa were represented by their top leaders while the US sent its Secretary of State Hillary Clinton. To the relief of all negotiators, an agreement had been reached that the world leaders could tout as a blueprint to a more responsible world. They called it “The Future We Want”. It is seldom that an outcome is reached in multilateral negotiations under UN without going into extra time. This was an exception. However, the outcome did not satisfy all. Outside the negotiation chambers, civil society groups slammed the outcome document as one without ambition. “Two years and one late night of negotiations later, diplomats in Rio are letting the world down,” said Jim Leape, director general of World Wide Fund for Nature, in a press statement released on June 19. Some even called the conference Rio minus 40 because they viewed the outcome as regressive. The same held true within the negotiation chambers. Even on June 19 when the document was adopted, some negotiators said they had agreed to it with a spirit of compromise. Ban Ki Moon, the UN Secretary General, admitted before the media that some member countries had complained the document was not ambitious enough. The negotiators complained that although it was balanced, it did not give enough consideration to the circumstances of each country. The European Union wanted to set ambitious targets and action-oriented goals for each country. It camouflaged it under phrases of green economy as a tool for sustainable development and sustainable development goals. The aim was to set green targets under which economic and development parameters could be gauged. But once the conference rejected their claims to a universal definition of green economy and referred the sustainable development goals to a committee to be formed under the UN General Assembly, their hopes were more or less dashed. In the evening, Brazilian foreign minister Antonio Patriota conducted the final plenary of the “pre-conference informal consultations”. Here, Denmark spoke on behalf of the European Union and stressed that the document should have led to more concrete actions. The African Union, which forms an integral part of G77+China, and the European Union wanted the United Nations Environmental Programme (UNEP) turned into a specialised UN body on the lines of UNDP or UNICEF. They wanted it to be called United Nations Environmental Organisation. But on strong opposition from the US, Brazil, India and China and some other developing countries, the African contingent dropped the demand. Kenya, which hosts UNEP, and Congo were the two most vocal countries. This showed in the final plenary where both reiterated their demand for a specialised UNEP. Japan said the document was not the ideal outcome. China was unhappy with the section on trade measures and technology transfer. The US was dejected that the reproductive rights of women were not recognised and priority themes for sustainable development goals had not been finalised. The US warned that the issue of forming a specialised UNEP should not be reopened, else the delicate balance of the outcome document would be disturbed. Leaders at the high level segment considered Rio+20 to be a job well done. Non-government organisations and activists think it managed to preserve the original principles of the Earth Summit, but had nothing for the future. Indian Prime Minister Manmohan Singh congratulated Brazilian President Dilma Rousseff for holding a successful conference and said, “the future we want should be a future in which there is ecological and economic space for sustainable growth for all”. Hillary Clinton went a step ahead by congratulating Brazil for showing deft and effective leadership which helped coalesce a document that marks a real advance for sustainable development. She was referring to using markets for financing as a solution to ecological problems. “It should be said of Rio that people left here thinking, as the late Steve Jobs put it, not just big but different. We should be thinking different about harnessing the power of the market,” she said. On June 21 more protestors sat near the entrance of Riocentro and tore copies of the outcome document. They condemned Rio+20 as a failed summit. Part of the blame, say activists, lies with the fact that there is still no North and South cooperation. Developed countries are still not interested in engaging with the developing countries. One of the easy takeaways from this conference could have been accountability standards for transnational corporations. But this too did not happen. Asad Rehman, senior campaigner of Friends of the Earth, the United Kingdom, says the good news is that this conference will not be called Rio minus 20. But the bad news is that “there is no interest in moving to a new model of sustainable growth”, he said. As a case in point, he cites sustainable energy, an initiative started as part of the Rio+20 process. He says it strives to provide modern energy to all, but modern energy also means power from clean coal and nuclear. How green and whose green? In Rio 1992, the buzzword was sustainable development. In Rio 2012, the buzzword was green economy. In Rio 1992, the term sustainable development was viewed as “something different” from development as the world knew it then. The term was contested by developing countries which did not participate in building this new vocabulary and so were worried about its implications. By the time the world reached Rio 2012, developing countries were beginning to grasp the challenge of practising growth which is sustainable and green. They had begun to embrace the idea that they could find ways of overcoming the problem by investing in new technologies and doing what is now known as the leapfrog dance—jumping over the incremental trajectory of economic growth by investing in best and front-runner technologies first. For instance, China is investing heavily in renewables; India has jumped the queue on fossil fuels by moving to compressed natural gas; Brazil is building a bio-economy of land and forests. But this is the past. 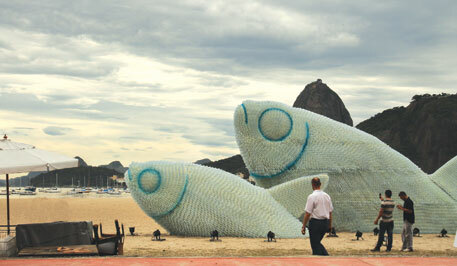 In the negotiations leading up to Rio+20, green economy became a familiar contest. The old economies preached green economy and the new economies cried that this was another form of protectionism, a dreaded word in a globalised world beginning to experience pangs of withdrawal. This was the battle at Rio+20; it divided countries and led to outcomes that nobody was happy with. But what is green economy? How does the world define green economy as different from the current economy? At the Los Cabos G-20 summit, leaders agreed to promote prosperity through inclusive green growth. For them growth was the bottom line and all things green were to help stimulate economies and jobs for the future. The first big push for the concept of green economy came a few years ago when global financial meltdown forced governments to fall upon the Keynesian idea to spend huge amounts of public money to bail out their economies. The idea was if this money got spent on all those things which would improve the environmental sustainability of countries, it would go a long way in building the foundation for the new-age world. But soon it was understood that governments spent little on greening economies (see ‘Germany’s green car plan’). However, the idea was too delicious to let go. It was discussed in every conceivable global forum till it gathered enough momentum to reach the negotiations before Rio. 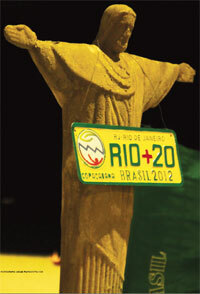 The preparations for Rio+20 conference were marred by fatigue and lack of an agenda. Green economy seemed to fit the bill. It became the flavour of the day. There was no prescriptive document to explain what green economy meant. There were two key players in the ring—the United Nations Environment Programme (UNEP) and the Organisation for Economic Cooperation and Development (OECD), the rich country think-tank based in Paris. UNEP’s work started with the Economics of Ecosystems and Biodiversity (TEEB), an international research project. The principle was simple—learn to value nature and its goods and services and use this valuation in policy decisions and investments. The example often cited is forests or water where improper pricing leads to discounting of the real role of the resource in national income accounting. Nature is destroyed. “Currently, we legitimise overexploitation of nature because we attach zero value to it in national polices and systems of national accounts. That needs to change,” explains Achim Steiner, head of UNEP. In the name of green fiscal stimulus, Germany decided to spend safely in ways it could benefit its powerful automobile lobby. The bulk of its green stimulus went into “scrappage bonus”—paying people money to get rid of old cars and replace them with newer, more fuel efficient vehicles. But this would mean manufacturing more cars, using more material and consuming more energy: good news for the economy, bad news for the environment. This when there is little evidence to prove that more efficient cars lead to lower emissions on the whole. In fact, all surveys have found that even as vehicles become more fuel- and emission-efficient, the total greenhouse gas emissions increase, for cars get heavier, people buy more and drive more. UNEP advocates targeted investment in key economic sectors, from energy to agriculture, to move the world towards this transition. It also suggests that a transition to green economy can contribute to eradicating poverty as a number of sectors with green economic potential are important for the poor. OECD, a firm believer in opening of markets, also has a strong view on the idea of a green economy. It has played a key role in advising G-20 governments on their position and then took the matter to Rio+20. Its 2011 report, Towards Green Growth: Monitoring Progress, proposes 25 indicators to define green economy—from biodiversity to measures on the objective and subjective dimensions of environmental quality. These measures provide evidence if economic growth is becoming greener; if greening of economy is opening new sources of growth. Measures of natural resource stocks. The basic contention is that green growth is a win-win option, which has little financial costs. This is what developing countries find objectionable. UNEP, for instance, has argued that the transition will only require some two per cent of the global GDP. Developing countries also worry about the fact that the policies and measures, suggested as enabling tools to drive green growth, would become prescriptive and so jeopardise national options for developmental strategies. But more importantly, they remain concerned at the use of these policies, measures and indicators becoming conditionalities that will become a playground for unilateral trade measures. The European Union’s aviation tax is their fear-refrain. At Rio+20, the idea of green economy was not contested. What was fought over was a global prescription for what constitutes green economy and the enabling measures and tools that would take the world to a greener tomorrow. The idea also got linked to the agenda of preparing sustainable development goals which were seen as ways to measure progress on this matter. Negotiations were contested. At one stage, G77 and China withdrew from negotiations saying that not enough progress was being made on their demands. The EU text was seen as too prescriptive. Switzerland then suggested compromise language for the transition towards sustainable development. G77 and China wanted more emphasis on social inclusion and for linkage between sustainable consumption and production with green economy goals. The US did not want references to the financial and technology burden of green economy goals on developing countries. The industrialised country delegates also “expressed difficulty” with the mention of lifestyle change. The EU, the US and Japan insisted on a qualifying reference to conditionalities on aid by inserting the word “unwarranted”. In other words, warranted conditions on aid and finance can be applied in the context of green economies. The final agreement was to recognise that there are different approaches, visions, models and tools available to each country to achieve sustainable development. Green economy was accepted as one such tool. The outcome read, “We consider green economy in the context of sustainable development and poverty eradication as one of the important tools available for achieving sustainable development and that it should provide options for policy making but should not be a rigid set of rules”. Governments agreed to tie themselves up in knots of words. Green economy is now a question for the future; when and how remain unanswered. The Rio+20 negotiations made no sense; the outcome even less. Every country could claim victory or defeat. In the end, the real loser was the Planet they were trying to save. 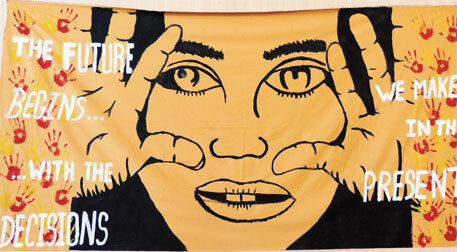 Some of the key issues were turned into a convoluted text in the final outcome, “The Future We Want”. THERE WAS NEVER A debate between developing and developed countries on whether Sustainable Development Goals (SDGs) are required for sustainable development, once the Millennium Development Goals end in 2015. In fact, the goals were one of the most anticipated outcomes of the conference. Brazil’s ambassador Raphael Azeredo called SDGs the “crown jewels” of the outcome document. Most of the debate was on identifying these goals. The European Union and developing countries under G77+China had divergent views. Early suggestions included taking up themes like food security and energy, conducting trials in countries with different levels of development and measuring their outcome. The EU wanted SDGs to be identified by the office of the United Nations Secretary General. Developing countries wanted SDGs to be defined by the UN General Assembly. G77+China wanted that every country must have a say in identifying the goals. It suggested formation of a working group which would report to the UN General Assembly with a blueprint. The EU wanted some of the SDGs to be identified in the summit, but it was not agreeable to other nations. For most part of the text on SDGs, it seems, the developing countries had an upper hand. The outcome document says SDGs should be action-oriented, concise and easy to understand. At the same time they should be aspirational, global and take into account different national realities, capacities and levels of development. But they should also respect national policies and priorities. The outcome document talks of setting up a group of 30 members nominated by the member states with the aim of “achieving fair, equitable and balanced geographic representation”. The group will prepare a roadmap for SDGs and submit it to the General Assembly in its next session, starting on September 24. While Indian negotiators maintain that the process of setting up SDGs was necessary as every country can have a say in its formulation, civil society and activists think the process is bureaucratic and cumbersome. Kumi Naidoo of Greenpeace International said it may be a good idea to introduce SDGs that are universally but not legally binding. But in Rio “they have not even been able to make progress on agreeing on the themes for the goals. All that they have produced is an inadequate and complicated process for further discussions,” he says. GOING TO RIO+20, the member countries knew there would be tough negotiations on finance and technology, and the means to implement SDGs. Means of implementation has always been a sticky subject in climate change negotiations, where developed countries do not transfer green technology to developing countries on the pretext that the current intellectual property regime does not allow them to do so. Finance, too, has been a controversial subject. Rich countries have always promised money but never revealed how much of it is additional. During negotiations, G77+China maintained that to keep the Rio+20 commitments, finance and technology would be a prerequisite. But the final document shows there is little that the developed world is willing to give. Developing nations asked for US $30 billion per year from 2013 to 2017 and US $100 billion from 2018 onwards. Australia, Japan, US and Switzerland opposed this, saying a conference like this was not the place to pledge money. India and other developing countries wanted the words “new” and “additional” in the finance text. But the US and other developed countries got them deleted. The only process set up was under the UN General Assembly which will find a strategy to finance sustainable development. Developing countries got nothing from these negotiations. Issues related to technology transfer in relation to intellectual property rights did not move ahead in the final text. It notes the importance of technology transfer to developing countries using phrases such as “on favourable terms, including on concessional and preferential terms, as mutually agreed”. But this technology transfer would be contingent to treaties signed after Johannesburg Plan of Implementation, which includes TRIPPS, and advances in World Intellectual Property Rights Organisation. In the final plenary, Bolivia along with Kenya, Venezuela, Cuba and Egypt, speaking on behalf of the Arab group, called the finance and technology section a step backward. The EU and the African countries proposed to make United Nations Environmental Programme (UNEP) into a specialised UN agency. Other developing countries opposed this as it is perceived that most policy level decisions of UNEP are dictated by the European nations. The US opposed this citing lack of funds. Instead of a specialised UN agency, it was envisaged that UNEP will have universal membership in its governing body unlike earlier when 54 nations took a three-year term each on rotation. However, UNEP will have more access to UN finance and resources, and greater engagement in the coordination bodies of the UN. The text also proposes to replace the Commission for Sustainable Development with a universal inter-governmental forum or a high-level political forum which will follow up on the implementation of sustainable development. THE HIGH SEAS, that area of oceans which is beyond the national territorial jurisdiction, covers half the planet’s surface area. But these global commons with significant biodiversity have no international regime to check overfishing, deep sea mining and pollution, particularly plastic. “And we are seeing devastation beyond our wildest dreams,” Alex Rogers, professor at the University of Oxford and member of the High Seas Alliance told the media gathered at Rio. In 1982, the world agreed on the United Nations Convention on the Law of the Sea (UNCLOS), which conveniently left out the high seas from its jurisdiction. Article 87 of UNCLOS refers to the freedom of the high seas, including the freedom of fishing, and says, these “rights shall be exercised by all states with due regard for the interests of other states”. In Article 63 (2), UNCLOS leaves it to individual nations to protect even the highly migratory species—fish stocks that straddle outside the limit of the exclusive economic zone. In 1992, the Rio conference agreed to strengthen the provisions of UNCLOS. In 1995, the UN adopted an agreement for the conservation and management of straddling fish stocks and highly migratory fish stocks. But the final agreement left the high seas high and dry. It devotes an entire section on the problems of the high seas, including ocean acidification and climate change. But on the matter of the international instrument, it decided to recognise the importance of “conservation and sustainable use of marine biodiversity beyond areas of national jurisdiction”; and to “note the ongoing work under the UN General Assembly of an ad hoc open-ended informal working group to study issues relating to the conservation and sustainable use of marine biological diversity beyond areas of national jurisdiction.” In this way, the agreement to begin thinking of negotiations for a global regime was deferred till the 69th session of the General Assembly, a two-three year postponement of a decision that had been already agreed upon. This deathblow came because of the aggressive lobbying of an unusual alliance. A coalition of rich and fish-hungry countries, namely the US, Canada, Russia and Japan, worked with the Left-wing government of Venezuela to ensure that the agreement was watered down. Venezuela argued they could not support the international agreement as it had not ratified the Convention on the Law of the Seas. “But the position of Venezuela effectively broke the consensus in G77 and China and weakened support for an international regime for the protection of high seas,” say campaigners working with the High Sea Alliance. Greenpeace issued a statement saying, “the one sensible outcome that was still on the table in Rio has now also been compromised into extinction.” Others like the Pew Environment Group and members of the High Seas Alliance believe some progress has been made as the final-outcome document contains recommendations like ending overfishing, taking action to stop illegal fishing, phasing out harmful subsidies, eliminating destructive fishing practices and protecting vulnerable marine ecosystems. The key, agree activists and governments, is to stop this “wild West mentality” on high seas. There are no rules for management and protection of the global commons. Furthermore, say activists, there is no legal means to establish marine reserves to protect biodiversity. The convention on biodiversity (CBD) has launched a process to identify mega biodiversity areas, which include the high seas. But CBD has no provision to declare marine sanctuaries. There is no enforcement against growing pollution and illegal fishing on the high seas. Non-biodegradable plastic has turned the oceans into a garbage dump. According to Natural Resource Defense Council (NRCD), a US-based group, plastic accounts for 60-80 per cent of the marine litter. It is widely accepted that a garbage patch of plastic is floating in the Pacific Ocean that is twice the size of Texas. NRCD says ocean currents converge in five large gyres where plastic gets concentrated. One of these gyres is in the Pacific Ocean. And this is not the only place in the ocean where plastic is found. This non-biodegradable material gets broken down into smaller pieces and is ingested by fish, making way into the food chain. Energy for all. But when and how? ENERGY ACCESS IS THE KEY ISSUE not just for economic growth but also for poverty eradication. It is also clear that energy sources contribute to environmental unsustainability, in particular climate change. So it was widely expected that Rio+20 would make the much-needed breakthrough in the twin challenge of making energy accessible to millions without electricity, and making the transition to clean energy. At Rio 2012, there were high expectations and a buzz in the corridor. Numerous meetings were held on the related themes of sustainable energy. The UN Secretary General’s global initiative on “Sustainable Energy for All” with its objective to meet the interlinked objectives of universal access, doubling of energy efficiency and renewable energy in the global energy mix, all by 2030, was highlighted. The initiative relies broadly on what it calls “voluntary commitments” of countries. But it hides the fact that this energy transition will cost the world some big bucks. According to the International Energy Agency, the world needs to invest over US $1.8 trillion in energy provisioning every year if it needs to meet the goal of sustainable and clean energy access for all, way above current spending. It was expected that Rio+20 would make financial commitments to reach this goal or at least suggest ways ahead. But the end result was no big deal. The final days of negotiations discussed all issues, including controversial aspects of removing fossil fuel subsidies. The final agreement was to note the importance of energy access in removing poverty and also global initiative. But developing countries fought back any move to set targets on domestic energy mix, including renewables. The document recognises that countries would set priorities according to specific challenges, capacities and circumstances in determining their energy futures. 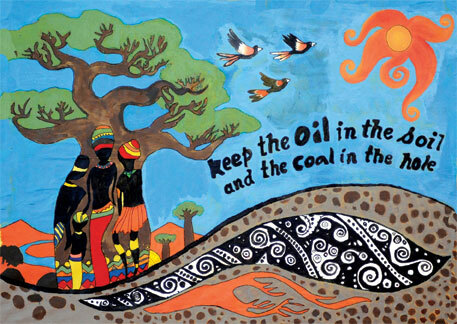 The Los Cabos G20 summit in its final declaration had already endorsed the need to phase out “inefficient fossil fuel subsidies, while providing targeted support for poor”. However, as the Indian experience shows, it is difficult for government to bell this particular cat. Compromise was the key word in the outcome of Rio+20 summit. Protection of the biosphere through sustainable development was not. But given the complex nature of multilateral negotiations, it is not difficult to understand why major decisions could not be taken. Every party has an equal say in such negotiations and reaching a conclusion becomes difficult if even one party objects. Therefore, when at the end of the summit it was said that the biggest victory was for multilateralism, it simply meant that the negotiators had squabbled enough and had finally reached a formula that did not have rigid rules and was open to further squabbles at a future date. The outcome document reflects this. It shows no forward movement since 1992, when the first Earth Summit was organised. In 1992, there was enough time to negotiate. Today, as scientists predict, the Planet’s carrying capacity is at its last leg. Therefore, even though the outcome lacks a tactile strategy, it must be converted into one in the coming years. Building on Rio+20 is the last hope against an impending ecological Armageddon. A number of promises have been made in the outcome document that must not get lost in the rhetorics of future negotiations. There was no agreement on the nature and scope of sustainable development goals. But the process of selecting these goals, which begins within a few months, must be taken up with urgency. Blending them with the concept of green economy, countries should set these goals to change the existing development paradigms and move from consumption-based, market-driven strategies to a more conservation-based equal opportunity regime. The overarching theme of these goals has to be poverty alleviation and environment protection. The year’s time given to the working groups to submit the report to the General Assembly must be sacrosanct. Countries have to realise that the Planet is a finite piece of space. The resources are finite and so are the markets. The financial troubles that the developed countries find themselves in will not dissipate through market-based solutions. The developed world must not use developmental mismanagement as an excuse for not keeping its promise of financially assisting developing countries. They must not complain of tight purse strings if they can loosen them for corporate bailouts. Technology transfers, too, must not get caught in a legal web of intellectual property rights (IPR) issues. The Planet comes first, IPR next. A set of concrete actions were expected to protect the oceans from overexploitative fishing, drilling for minerals and oil, and pollution. But the subject was dealt with a spirit of procrastination. The outcome document postpones any regulation to protect the high seas for two to three years. 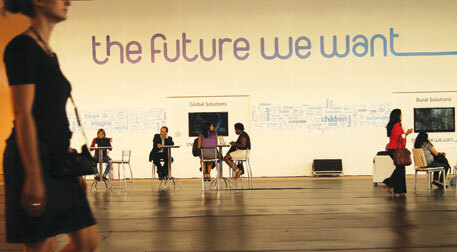 What did Rio+20 mean for India? Did India secure its right to development or its right to pollute? India cannot afford business as usual, that is development as preached and practised by the already industrialised world, where one first gets rich, pollutes and then cleans up. The industrialised North could afford it only because it had capital to mitigate the environmental costs. India cannot even pit environment against development. The country has a large number of people whose survival depends on healthy environment. It cannot afford development that destroys land, water and forests and takes away their economic future. The green growth message of Rio+20 cannot be ignored. India’s green growth strategy has to be based on home truths, on imperatives of building durable and local economies based on natural resources. This growth has to be frugal, innovative and sustainable. India was right in resisting half-baked global prescriptions for green growth. Our right to development is non-negotiable. But our imperative is also to get this development right. Are we ready for global unity?